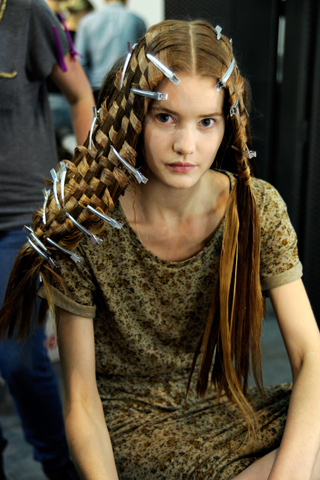 At Alexander McQueen Spring 2011 Ready-to-Wear, Guido Palau’s basket-weave hairstyles were incredible. “There were many permutations,” Palau said to Style.com of the technique, “but in the end it was highly technical yet very simple.” Palau divided models’ hair into three sections before adding extensions over and under natural strands for a woven effect, ending each panel in a skinny braid. Back panels were folded flat against the head and pinned in place before the entire head was sprayed with Redken’s Forceful 23 hair spray. 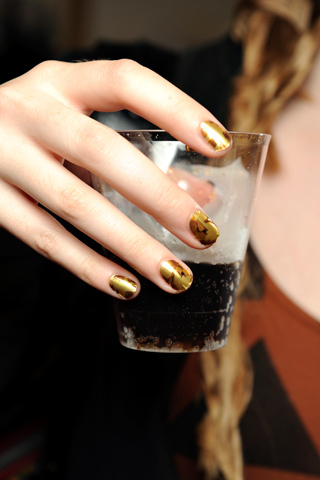 Sixty bottles of hairspray were used to hold everything in place! very different, I think those extensions will feel heavy in the head. 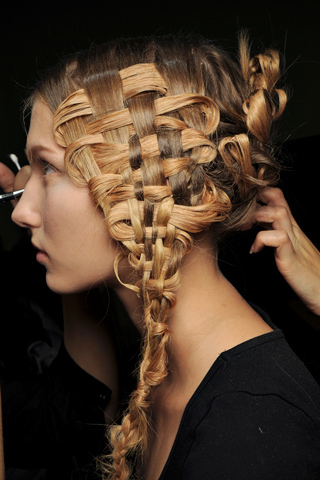 Very creative-hair weaving really is amazing when a talented stylist enjoys the art they create with hair. We hope they didn’t have any issues with tangled hair-when taking down the hair weave style. Those braids look ratty! That’s got to be one of the worst displays I’ve seen. It’s ugly and distracting from the clothing. There were actually a couple of nice dresses, but I had to watch the video a second time to see them.